Introducing the new Streamfeeder V-2000 – the latest addition to the Value Series. And now it’s CE certified. 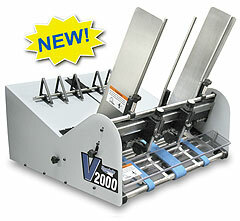 The Streamfeeder V-2000 is a continuous feeder for applications such as ink jet printing, tabbing, and labeling. It is capable of feeding a wide variety of materials at high speed with exceptional alignment qualities. Features include quick and tool-less setup, quick make-ready, and easy maintenance. For example, feed belts can be repositioned with the use of single knob adjustments, and belts can be replaced quickly. The side guides also feature single knob adjustments and can be quickly removed without tools. Two independently adjustable separators help improve feeding of uneven materials. Newly designed material levelers also feature single knob adjustments. To download Brochure & Technical Specification, click here.